NEWLY PRICED BELOW APPRAISED VALUE! SELLER IS READY TO DOWNSIZE FROM BELOVED HOME! Lovely custom home in Bayside, on a 1/2 ACRE lot at the end of a CUL-DE-SAC. 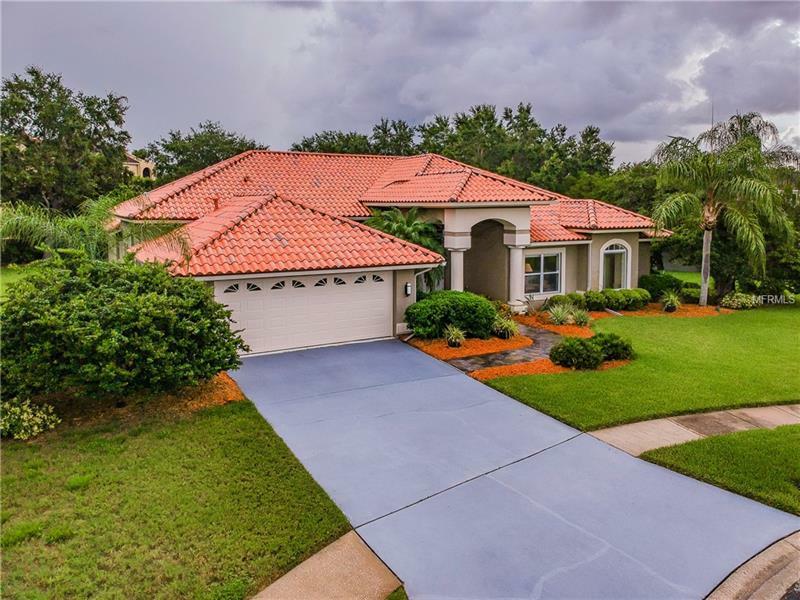 This POOL home has been beautifully landscaped with UP-LIGHTING & has been meticulously maintained by this one time owner. The moment you walk in the door, you will love the casual but elegant feel of this home. Great OPEN FLOOR PLAN with HIGH CEILINGS & spacious rooms, just great for entertaining! Beautiful formal dining & living room have sliding doors that pocket into wall, bringing the outdoors in with lots of natural light! Beautiful glass FRENCH DOORS lead to the large kitchen & family room, & can be closed off to separate the 2 spaces. Huge kitchen overlooks the family room & features a cooking island, corian counter tops, 42" wood cabinets galore with pull out drawers, closet pantry, & built in desk. You will love the breakfast nook surrounded by mitered glass to enjoy your view. The family room is the heart of the home with fireplace, SURROUND SOUND & wall of pocketing glass doors leading out to the SCREENED IN POOL & FENCED yard. SPLIT FLOOR PLAN with 3 over-sized bedrooms & pool bath off of family room, with the & master suite & DEN just off the living room. Spacious master suite features triple sliders, WALK IN closet, dual vanity, garden tub & shower. NEWER TILE ROOF, OVER-SIZED GARAGE WITH STORAGE, SECURITY SYSTEM & MORE! GREAT LOCATION, 15 mins to airport EXCELLENT SCHOOLS, & BERKELEY PREP 5 MINS AWAY! MAKE AN OFFER TODAY!